"A storm's a comin', baby." 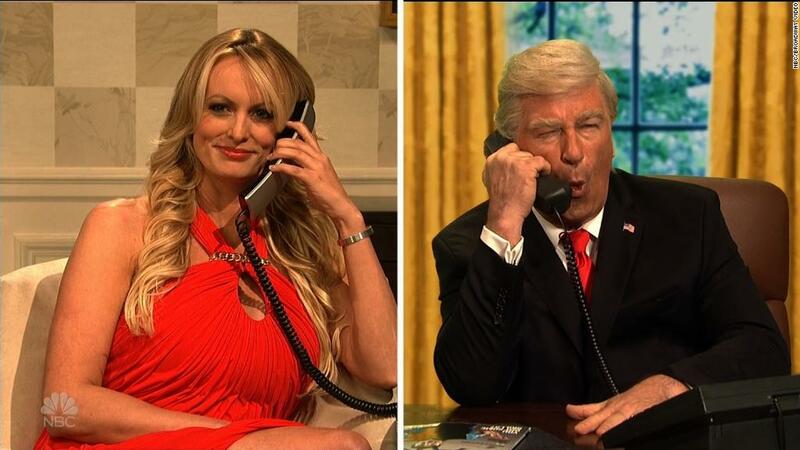 That's what the actual Stormy Daniels said to Alec Baldwin's President Donald Trump on this week's edition of "Saturday Night Live." The actress appeared in the cold open alongside many other big names that surround Trump. One such name was Trump's lawyer, Michael Cohen, played by Ben Stiller. "What's up, amigo? How are you holding up in prison?" Baldwin's Trump said to Stiller's Cohen over the phone. "I'm not in prison," said Stiller's Cohen, who called Baldwin's Trump from a pay phone. "Oh well, give it a couple of weeks," the faux president responded. Baldwin's Trump then said to call another one of his lawyers, Rudy Giuliani, played by Kate McKinnon, saying that he has "the sharpest mind since 'My Cousin Vinny.'" However, Cohen accidentally phoned Trump's former personal doctor, Harold Bornstein, played by Martin Short. "This is Harold Bornstein. Would you like to know any of patient's medical history?" Short as Bornstein asked before Stiller's Cohen called Giuliani, who was appearing on Fox News during the call. Trump and Cohen then connected others like Aidy Bryant's Sarah Sanders, Beck Bennett's Mike Pence, Cecily Strong's Melania Trump, Leslie Jones' Omarosa Manigault and Ivanka Trump and Jared Kushner, who were played by Scarlett Johansson and Jimmy Fallon. "What do you need for all of this to go away?" Baldwin's Trump asked Daniels. "A resignation," she responded to cheers from the audience. Daniels and Baldwin's Trump then opened the NBC variety show with its catch phrase, "Live from New York ... It's Saturday night!"